A garage is to a car what a health facility is to the human body; both require regular checkups. Every once in a while, the car will need servicing and repairs on the garage. There are essential tools that every garage should have. The tools make the work not just easier but also very enjoyable. Of course, there are essential tools one should never miss in a garage, like pliers, spanners, screwdrivers, and such. These are necessary tools you’d never miss in any garage. 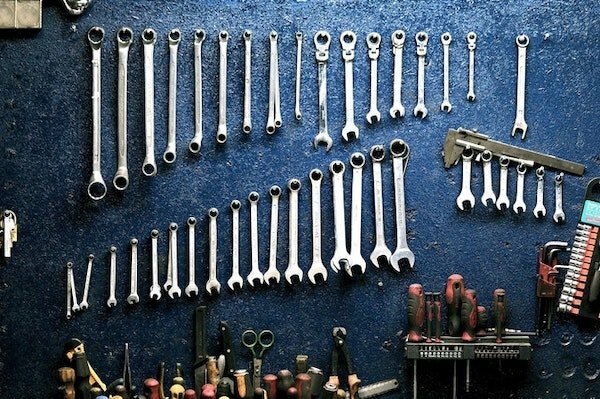 In this post, we’ll be discussing the essential tools you should always have in your garage. Proper lighting; fluorescent lights and ordinary light bulbs are great; they enable you to work at night or in partial darkness. However, you’ll soon realise that the car’s underbelly is dark and that an additional source of lighting is needed. Forget the mercurial images of mechanics holding a flashlight by their teeth as they fasten nuts and bolts under the car; you’ll need something more practical. There are portable lights specially designed for this job. The halogen lamps help light up the entire space so you can pinpoint tiny screws and nuts in hard to reach areas of the engine. Bench; again, you can do without a bench in your garage, depending on the tasks you conduct therein. However, it is highly advisable that you invest in a good, solid bench. A bench will come in handy especially if you do metal work, use sandpaper, a saw, cut conduits, and so on. Such a bench should come complete with a vice to help you clamp and hold parts you’re working with. While at it, considering getting an anti-fatigue mat to help relieve your feet when working for long hours. Hand tools; these are necessary and essential tools every garage should have. They include screwdrivers, hammers, saws, spanners, pliers (both needle nose and vice grip), utility knife, level, tape measure, power tools, to mention a few. A socket set is also a must-have; it’s easier buying the entire collection than purchasing individual items. A socket set will include tools like T-Bar drive handles, Swivel-head drive adapters and speed wrenches. Some reputable brands in the world of Socket Sets include Kobalt, Craftsman, Snap-on, to mention a few. Safety gear; your safety is of paramount importance when working inside a garage. Busted knuckles and other minor injuries are inevitable as long as you’re working in a garage. However, you can minimise the risk of injuries by investing in essential safety gear. Get a fire extinguisher, a first aid kit, gloves, and safety glasses. Where possible, a garage should have a safe exit door. WARNING; never smoke inside a garage, avoid storing flammable objects inside your garage unless it’s inevitable. Floor Jack, Jack stands; make sure the floor jacks you buy can purchase the weight of your vehicle. You can get a 2-ton jack, 2.5-ton jack, and so on depending on the car you’re dealing with. It is recommended that you have at least four Jack stands. While the ordinary Jack in your car’s trunk will come in handy when changing a tire, it may not be so useful when you want to work underneath the vehicle. Torque wrench; some lug nuts and engine bolts are delicate, you crank them down so tight, and you damage them; they require precision tightening. They have to be tightened to the right angle, right torque. To do that, you’ll need a torque wrench that may cost you anything from $100 to $150. Some digital models can go for as much as $500. Air compressor/Air Tools; apart from inflating your car tyres, an air compressor helps blow and clean car parts or tools. A good air compressor should produce not less than 90 psi for it to run your air tools effectively. Air compressors and air tools can be a pricey investment, however, not necessary if you run an average home garage. Note: These tools are great and comes handy at time but working in your garage in winters would be a hard task. Apart from the technical tools you should also, install a heater in your garage for your convenience. A garage is more than just having a spacious room set aside for your car repairs. It is more about the tools you have at your disposal. Having the right tools will make you complete your tasks faster and without breaking much sweat. You also enjoy working on your car when you have the right tools with you. Cheap is expensive, opt for high-quality tools rather than cheap ones that will get damaged or broken after a few months of use. Do you think we have left out any essential tools in our list above? Please feel free to mention them in our comments section below; we may consider adding them in our next post on Top 10 Tools every Home Garage must have.